It's Waraku Japanese Casual Dining's Anniversary month! 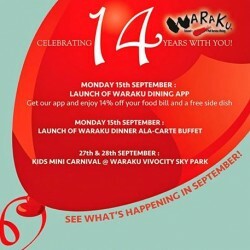 Get the Waraku Dining app and enjoy 14% off your bill when you dine at any Waraku JCD plus find out about their latest in-store promos! The app is available for download at Googleplay and Apple App Store!